Visit Young's RV Center in Fremont, Ohio to see this double slide Salem Hemisphere 312QBUD Travel Trailer. 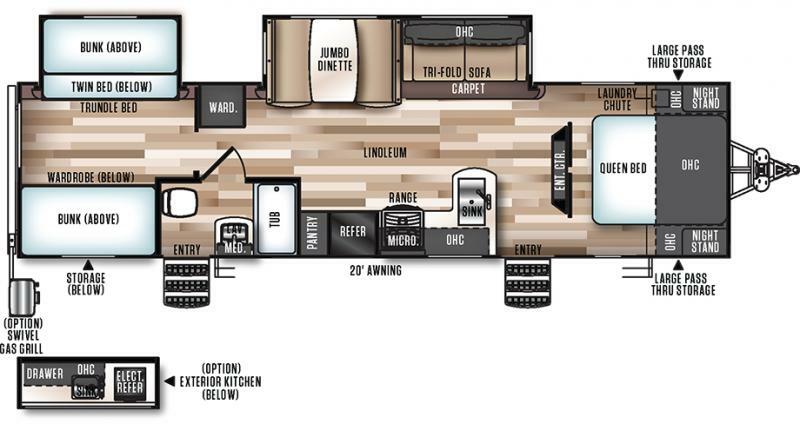 This Hemisphere Trailer has a spacious floorplan and some great options to keep you traveling in style. The 312QBUD features a front master bedroom with queen bed and double mirrored wardrobes with drawers below. The living area offers much room for entertaining or just relaxing thanks to the booth dinette and tri-fold sleeper sofa slide-out. The kitchen is fully equipped with a Residential refrigerator, 3-burner range, microwave, stainless steel single bowl kitchen sink, and pantry. There are also plenty of drawers and cabinets for all of your kitchen essentials. The enclosed bathroom is complete with a tub/shower, toilet, sink with medicine cabinet, and a 2nd Entry/Exit door. And finally, to the rear is the bunk room with bunk bed slide and Jiffy sofa underneath. There are additional bunks over the entertainment center and wardrobe. This Salem 312QBUD also has overhead cabinets throughout for so many storage possibilities. If you are looking for the Perfect Family Travel Trailer, this is it!! !